Raids are being carried out across the country by the Income Tax department in the wake of the burgeoning fake currency racket post demonetisation, as currencies both new and old have been seized in large amounts from Bengaluru, Panjim and Faridabad and Chandigarh besides the national capital. The Enforcement Directorate on Wednesday seized Rs 2.19 crore from Chandigarh as part of its operation to check hawala trade in the wake of demonetisation. Officials said the sleuths of the agency swooped down on the premises of the cloth trader and few other locations, based on a tip-off received by them about huge illegal currency stashing. While the ED said Rs 18 lakh in new notes was recovered, Punjab Police said Rs 69.35 lakh in new currency was recovered during the raid. Action has been taken under the provisions of the Foreign Exchange Management Act and the searches are still on, they said. Chandigarh Deputy Superintendent of Police Ram Gopal said a team led by ED’s Deputy Director Gurnam Singh conducted a raid and seized Rs 1.50 crore in demonetised currency and Rs 69.35 lakh in new currency. The raid was carried out at house of one Inderpal Mahajan. He has been arrested and a case has been registered against him. The Income Tax Department made a seizure of Rs 3.57 crore cash, with Rs 2.93 crore in new notes, from Karnataka and Goa with a huge stash being recovered from a flat in Bengaluru which was guarded by two ferocious dogs and an old woman. Officials said the department sleuths got a tipoff that an apartment in the Yeshwanthpur locality had some cash but they could not execute the search yesterday as the old lady living in the flat refused to cooperate with the taxman and tie the two canines she had. Finally, the sleuths made an entry with the help of locals and police and found a room that was locked. It was also noticed by the I-T teams that a person visited the flat in the wee hours. "The locked room was opened and unexplained cash to the tune of Rs 2.89 crore, which includes Rs 2.25 crore of new Rs 2,000 notes, was found. In a separate case in Goa's capital Panaji, the department seized Rs 67.98 lakh in new notes of Rs 2,000 from a person who met the sleuths who were acting as decoy customers in desperate need of cash. 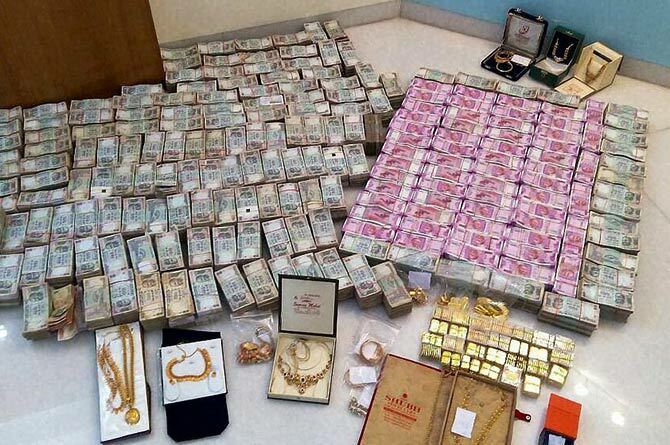 The department's probe wings of Karnataka and Goa, post demonetisation, have seized a total of Rs 29.86 crore, with Rs 20.22 crore in new notes, 41.6 kg bullion and 14 kg jewellery as part of investigative action to check profiteering in the wake of currency ban. In Faridabad, four were arrested with new currency of over Rs 25 lakh in the new Rs 2000 notes. Meanwhile, in Delhi, unaccounted cash worth Rs 64.84 lakh were seized from real estate agent Sukhbir Shokeen in Delhi; Rs 11.34 lakh is in Rs 2000 notes. yet another raid was carried out at a hotel in Karol Bagh following which the massive amount of Rs 3.25 crore was recovered in old notes. Upon interrogation it was found that the money belongs to some Mumbai-based hawala operators, who hired packaging specialists who pack these notes in such a manner that it was even undetectable by airport scanning machines. The I-T department has seized the cash and is analyzing the mobile details which allegedly contain details of lot of other hawala operators. This recent raid comes in the wake of yet another raid carried out in the national capital, where in a joint raid conducted by the Income Tax department and the Delhi Police, Rs 10 crore was recovered from a law firm in Greater Kailash area. Acting on a tip-off, the police recovered Rs 2.5 crore in new currency notes and the balance Rs 7.5 crores in old currency notes from the T&T law firm owned by Rohit Tondon late on Saturday night. Unaccounted cash worth Rs 13.93 lakh, including Rs 8 lakh in new notes of Rs 2,000 and Rs 500, were seized from a local businessman in Chhattisgarh's Raigarh district. There was information that the businessman, who runs a gift shop, was involved in exchanging scrapped currency notes with new ones following which a police team raided his premises, including the house, and seized cash worth Rs 13,93,173, he said. The recovered money included Rs 7,76,000 in Rs 2,000 denomination, Rs 24,000 in the new notes of Rs 500, Rs four lakh in the banned notes of Rs 500, besides Rs 1,93,173 in lower denomination notes, he said. At least 17 bank passbooks, 40 ATM cards, Aadhar cards and other identity proofs in the name of different persons were also seized from his possession, he said. Following the massive raids on the premises of three Chennai-based businessmen, the Income Tax department last Saturday confirmed seizing Rs 24 crore in new currency notes in Vellore, Tamil Nadu. During an investigation, the I-T department found out that some cash was hidden in a car in Vellore, upon which it was discovered that all currency was in the form of Rs 2,000 notes in 12 boxes of Rs 2 crore each. Upon interrogation of those detained in Chennai, a breakthrough was made in the recovery of this cash wherein the IT sleuths laid a trap for the person transporting Rs 24 crores in Vellore and subsequently seized the currency. Interrogation is currently underway of those who were detained in Chennai which could lead to further recoveries. Following demonetisation, the Enforcement Directorate had carried out massive raids in 50 branches of 10 banks across the nation in an attempt to keep a tab on those account holders, who deposited huge amounts at one time.